Another Monday....Another challenge from MJ over at TechnoStamper - definately a challenge this week. Wonder where MJ's getting those arrows from??? I kept thinking about the challenge, as some of the girls made mention of the arrows, and I hadn't even looked at the challenge. I tired to free form the arrows, but that wasn't working - so I put a little spin on my card and used these great rub on's from Bo Bunny, that I got from Allie at Croppinsville. 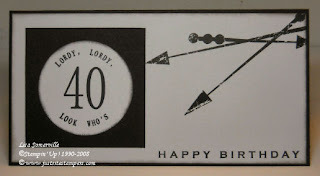 To create my "Lordy, Lordy, Looks Who's 40, I used my Just Rite Stampers. Have you seen the sneak peeks for the new stampers that Just Rite is coming out with? I can't wait to see them at CHA this week! I know Allie mentioned she'll be placing an order with them at CHA - can't wait to see what she orders. If you'd like to play along with this weeks sketch - simply leave a comment and a link to your card on this post, or if you upload to SCS, use keyword TS26. Great job Lisa. I am not even sure where I get the arrows from! I love how you got around it. I so want one of those Just Rite Stampers! They are really cool. Thanks for playing even on the "hard" weeks, lol. 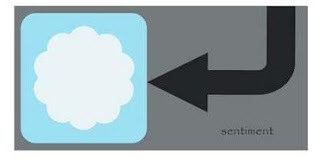 VERY cool and VERY creative way to add those pesky arrows! LOL!